Painter Bill Guffey is an artist unlike any other. Not only is he remarkably prolific and successful, having sold 30 to 40 paintings since March 2008, he also works in an unusual style. From his home in rural Cumberland County, Kentucky, he has painted everywhere in the world using only the Street View function in Google Maps. 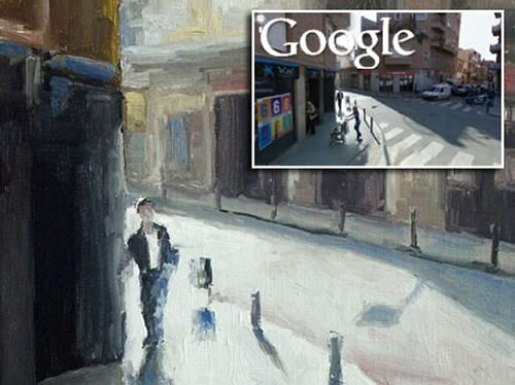 Via Google Maps’ ability to manipulate pictures to get the angle desired, Bill has created an impressive array of art without ever actually laying eyes on any of the locations he’s painted. It’s amazing just how small the world is getting these days. Rural Kentucky and a villa in Florence, Italy are separated by only a few clicks of a mouse. At this rate, it won’t be long before you can click on a location in the map and buy a personalized painting from Bill directly through Googlezon.